Hearthstone’s Knights of the Frozen Throne expansion card reveal season has started! We can expect to see multiple cards revealed on daily basis for the next couple of weeks leading up to the expansion itself. In this post, I take an in-depth look at Blood Razor. 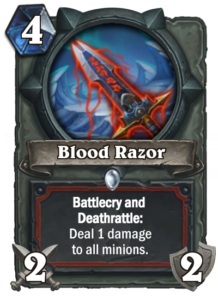 Blood Razor is a common Warrior class card from Knights of the Frozen Throne expansion. It is a four-mana 2/2 weapon with both Battlecry and Deathrattle to deal one damage to all minions. This is really exciting! It’s reminiscent of Death’s Bite, the most powerful Warrior weapon in the history of Hearthstone, and looks set to see a lot of play. It is generally not quite as strong as Death’s Bite, as it is able to deal three damage to its main target on play as well as on Deathrattle, as compared to the four and five damage that Death’s Bite was able to deal. It remains to be seen what the key break points are: in Journey to Un’Goro meta, Rallying Blade gained some popularity in Paladin over Truesilver Champion as there were so many three-health minions for it to target – but also because it was playable one turn earlier at three mana, something Blood Razor is not. This uncertainty can prevent Blood Razor from reaching its full potential, if it turns out that you really need to destroy four-health minions on Turn four. Whirlwind effects are crucial for any slow Warrior decks. I have never felt like I’d have too many Whirlwind effects in a Control Warrior deck, and with Blood Razor adding another option alongside Whirlwind and Ravaging Ghoul, it will be interesting to see which ones will prevail and earn a spot in the deck. I predict Blood Razor to be run at least as a one-off instead of Whirlwind – while that Turn three Whirlwind + Sleep with the Fishes can be nice, it is not that common to draw the combo that early, and later in the game Blood Razor’s mana cost is not as prohibiting. Whirlwind itself only became common in slow Warrior decks after Revenge rotated out, it was never the first choice, just the most viable substitute. Whirlwind effects can also be used effectively by midrange Tempo Warrior decks that have fallen out of favor with Un’Goro, but that used to make up a good chunk of the Warrior population. Frothing Berserker, Bloodhoof Brave, and Grommash Hellscream are some of the prime synergy targets in such decks. It is even possible to trigger both of Blood Razor’s Whirlwind effects on the same turn, although that gets a bit expensive: a weapon’s Deathrattle can be triggered by playing another weapon on top of it, destroying the previous weapon in the process. Furthermore, the fact that the second Whirlwind effect does not cost any mana on the turn it is used is a big deal: it can enable significant combos with King Mosh, Grommash Hellscream, Blood Warriors, or Sudden Genesis in the late game or simply make early-game combos possible faster, for example buffing up a Frothing Berserker. Whenever you can do something for free, even if you have paid for it on a previous turn, things get interesting. Primordial Glyph extends a Mage’s reach by frontloading part of the cost to an earlier turn. Blood Razor can enable new things for Warrior because it also allows the same, even if it is just one mana compared to the Whirlwind spell. It will be interesting to see if any new combo decks can be built thanks to Blood Razor!